Everyone loves a good slow cooker recipe, and this Crock Pot Mac and Cheese is so simple, cheesy and delicious. 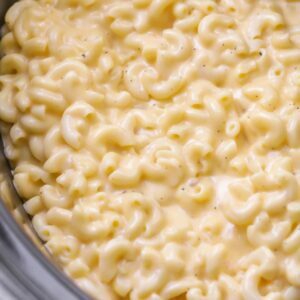 With loads of cheese, butter, and sour cream it's hard not to love this creamy macaroni and cheese recipe. Bring water to a boil and cook macaroni for 6 minutes. Drain and set aside. In a medium pan, mix butter and cheese until cheese melts. Add sour cream, soup, salt, milk and pepper until combined. Add this mixture to the slow cooker along with the cooked macaroni. Mix until combined and cook on low for 2 hours stirring every once in awhile.